Find a person that has the right qualifications to do the job can be an exhilarating feeling, especially if that person will help with the growth of your business. On the flip side once they’re employed in your business, finding out they exaggerated their skills can end up a massive waste of time. With over 300 employees under my belt, I’ve developed a method to measure the top 7 attributes every VA must posses to be a part of my team. I share this in detail along with how you can make sure they’re telling you the truth. 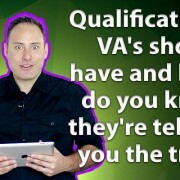 Hey, David Judge here and today I’m going to discuss Qualifications your VA should have and how to know if they’re telling you the truth. Like a number of other subjects I’ve covered previously, this is a really interesting subject especially around the question of trust and I’m going to share a few really good reasons I’ve included this as a part of today’s conversation. Before we get into that, let’s talk about the Qualifications a VA should possess and a good way to identify the best qualifications is to first of all understand the style of tasks you would like your VA to perform. I’ve actually covered that previously and you can check that out here, where I talk about a simple process to identifying the tasks you could outsource in your business. An important point to mention here is there are 2 types of VA’s that I call Universal VA’s and Specialist VA’s. A UVA would suit a business where they wanted to cover a variety of general tasks, from email and calendar management, through to updating of your social profiles. If you’re looking at more specialized tasks like Programming, Advanced Video Editing, Graphic Design and Advanced Content Writing then you’ll need a person specialized in that actual task. Aside from the difference of the experience between the both of types there is also a price difference in how much you would expect to pay for a UVA compared to a SVA with the SVA obviously a higher investment due to their specialist experience. So lets talk about UVA and the basic skills they should possess. The first few times I used to use oDesk (this is a outsource job posting site) I placed my job and within a few hours had around 20 applicants. Of the 20 around 15 were people that clearly had not read the description and pasted pre written responses. Of the remaining 5, 2 of the people looked like they could do exactly what I wanted and their applications really well written where they detailed that they could do the tasks. I decided on the person that had the highest number of hours experience and let them loose on the task. 4 days later they delivered the project and it was TOTALLY DIFFERENT than what I had asked for. I contacted them and they said they would fix it right away and the second version was worse than the first. I confronted them to ask what was going on and eventually they told me they didn’t have experience in the task, but they really just wanted me to give them an opportunity to learn the task. Am I Running A Charity Or A Business? While this would be ok if I was running a charity, in business I needed what I had asked for and for it to be delivered within a timely manner. What was really interesting is in the next job posting I decided to interview people and when I asked them directly if they could perform the task a large percentage couldn’t. It was the same deal… they either wanted someone to help them out by giving them the experience, had another family member help them by completing the application or simply lied as they wanted a job. This also followed through to their resumes. A lot of times the actual truths around these were greatly exaggerated masterpieces they had paid a professional to help them prepare. After a lot of painful hours I realised if I wanted to get a different result I needed to change how I was employing people for the jobs. I realised I really needed to break past the initial CRAP if I was going to understand how good a person really could be. This is the foundation of the top 7 skills I now look for when I’m employing a VA. When I mention these skills to people they’re normally really surprised and wonder how I’m able to measure their ability in these areas. The big question is how you can effectively measure these 7 skills, especially when a lot of times the people you employ are in a totally different country. Before we wrap up I’m going to share the process I use which is still an evolving piece of art. It has taken me 4 years to get to the place I am right now and is the reason I’m able to consistently get good quality people. Ok the first stage is for them to supply their resume, but I also have each applicant complete a really detailed questionnaire. Within this questionnaire I include problem solving questions, questions that test their English, questions that test the applicants common sense and a few other important questions that test if they will get past stage 1. Based on the questionnaire I know really quickly if they possess the required skills and means I can go through a lot of potential applicants to decide the ones that will make it to the next level. If they make it through on the second stage I test these skills a second time, but LIVE. I provide a series of tasks they need to perform and use Google Drive to watch them complete the task live. From here I can confirm they weren’t honest on their questionnaire and can see how long it takes a person to complete each area. The other cool point about this part is I can run about 10 people at one time as you can basically flip between each person and watch as they complete. Finally, if they make it through to this stage we do a one on one interview where we ask as many questions as possible to identify any potential issues and we also give them 2 impossible to solve scenarios designed to see how they handle pressure. Starting to get an idea of how intense this process is? I ultimately look for a person that ticks all of these boxes and whilst I ask for a resume and a few basic questions around their specific skills, I find these attributes are far more important than anything they can say on a resume. What I’ve found is a person that makes it to this stage can not only pick up the required skills if there are any gaps, they are able to pick them up fast and always ask questions to improve how they’re adapting and learning. So that’s the top 7 qualifications I find critical in successfully finding a VA and in all honesty I pay very little attention to what they say they can do and instead put them through my process that always identifies the person that has the right goods. Ok, let’s wrap up… In the next sessions I’m going to share How long it should take a VA to integrate into your business. How much should I pay for a VA?